Driving is not just a way to transport yourself from one place to another anymore. Driving is an experience. A study says that an average New Zealanders spends about two and a half years of their life stuck in traffic, which means that it’s almost our own private accommodation for a lot of us. Let’s look at some stuff that will make the car a shinier, fancier and smarter space to be in. We are all attached to our new and old cars. In fact, some of us even name our cars, some of us go to the extent of talking to our cars as if it were a friend. It’s all because we clearly spend a lot of time with our cars. Since we have accepted our relationship with our cars, shouldn’t we be making it a better place to be in? Our cars become like a private space for us, which means we don’t carry anything on us, it’s all in the car. We don’t even carry our jackets to class because if we do, what do we have the back seat for? But everything seems to be on top of the other after one point in time and you realize that you just created a miniature version of your bedroom in your car, you can’t find anything! But wait no more! It’s time for you to get a Car Back Seat Organizer. It’s a cheap accessory that is available online as well as offline. It has numerous pockets for you to store your phone charger, your notebooks(the electronic and the regular), your makeup, accessories, stationery, food and whatever you want to carry with yourself. But if you think you carry even more stuff than all of this, there are a lot of ways to keep your car more organised. Or not. We all know how stuffy and murderous our cars can get when we leave them alone in the sun for a few hours (nobody likes being lonely). It’s time we expressed some empathy towards our traffic partners. Accessories like a sunshade or a sun close can help prevent your car from getting heated up. A few variations can even reduce the temperature of your car and keep it at a controlled temperature. A sunshade is a relatively simpler version of the sun close, cheaper as well. A sunshade will only cover the windshield for you as a sun protection, but the sun close is like a jacket for your car. A nice efficient sunshade costs about 10$ or more. A sun close will cost you 10x the price. It’s more of a requirement based accessory, so if you hardly park outside of your home garage or office parking that is already protected by the roof, a sunshade would be a better option. But if you have a parking space without a roof or if you park outdoors more often, a sun close would be a perfect option. Let’s admire the quite evident pun just like we admire our pets? But all pet owners know that any amount of love and pampering is not enough for our cute little fuzz balls. But what happens when we put them in our car? They get paranoid! Or they love it. Or both. Either way, it’s our duty as pet moms and dads that we ensure they’re comfortable in our portable bedrooms. Hence, presenting a Car Pet Back Seat Cover. It’s like a small bed for pets. There are a lot of variants available in the market that are waterproof, with or without covers for your car doors on the side, a blocking frame to prevent the pet from getting into the driver’s seat. This will make your pet very comfortable on long trips or even short ones, if you’re training them to travel in cars. This amazing pet-friendly car accessory is extremely easy to fix and is fordable, so you can keep it in your hood for use in the future. The best part about these covers is that it keeps your car clean and scratch-less even after your pet has been in and out of it. This pet-friendly car accessory is also very affordable, as it is available for as low as 20$. The more comfortable ones with additional features are definitely more expensive. Everybody loves neck pillows. Why? Because it saves you from neck and shoulder aches after flights. This Car Headrest is a distant and more efficient cousin of the neck pillow that won’t let you sprain your neck when you’re on your way to work in a carpool and doesn’t let your head hang like a wilted flower. It’s a car accessory that you can fit on your car Headrest, but isn’t heavy or ugly. You can get one to match your car interiors and let your kids or spouse be at ease on their way back or on a long road trip. “What’s that smell?” is one of the most common things you will hear a car owner say. That’s because cars are like magical chambers where everything you put just magically disappears. Then we forget about its existence until it starts to smell. More often than not, this disappearing object is food. Keeping a Deodorizer handy will help you get rid of offensive odors. If you get one that has additional fragrance, you car will always smell nice and fresh. There are a lot of other accessories that make a car a better space to be in. 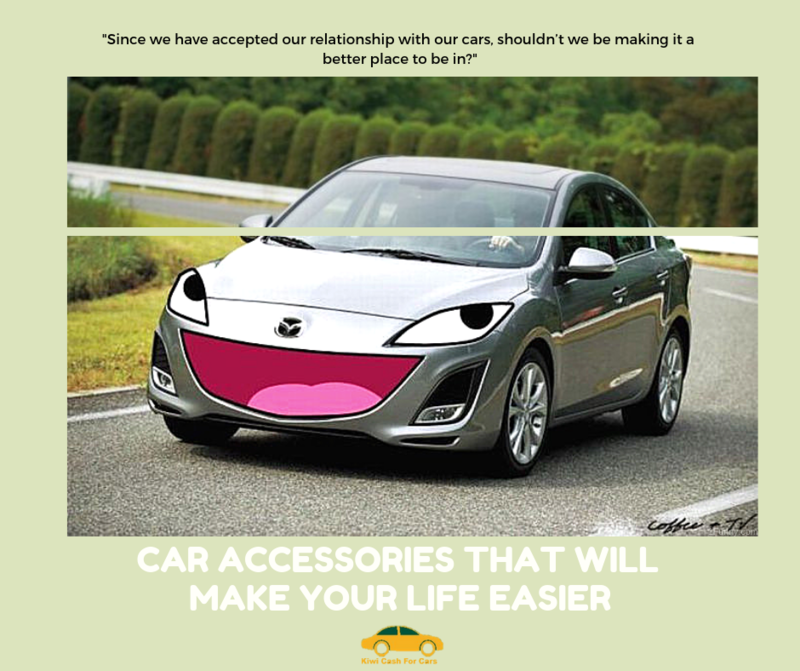 Having these additional car accessories will also make it easier for you to sell your car for more cash. These are additional investments that you have that you can get paid for if they’re maintained well.